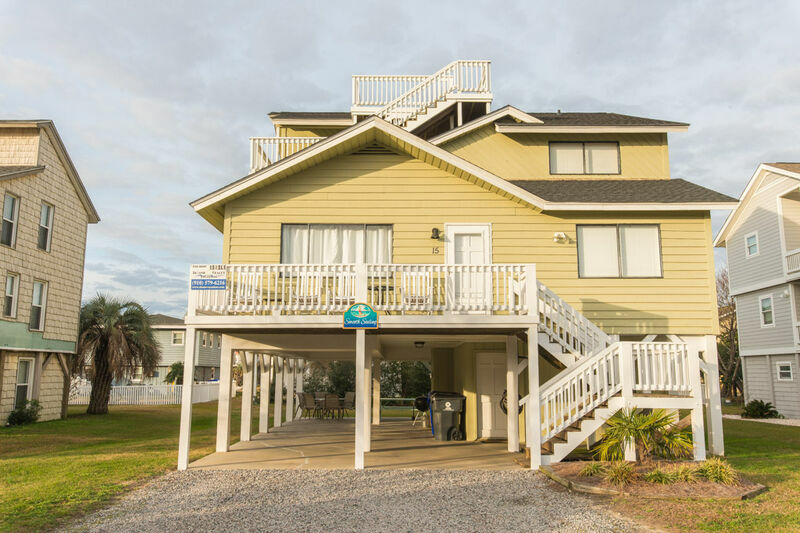 Smooth Sailing 5 Bedrooms, 3.5 baths located on quiet side street on the west side of Ocean Isle Beach. Just a short walk away from the ocean makes this the perfect place to spend your time at the beach. This comfortable and inviting home offers a fully equipped kitchen to prepare your favorite seafood or family dishes with microwave, dishwasher, ice maker, and dining for family to gather together. Washer/Dryer in laundry room on ground level. Throughout the home you will find 5 Cable TVs, a DVD player, WiFi, rocking chair front deck. Outside Shower (not enclosed). Picnic table and additional seating in covered carport. Two charcoal grills. Located on a direct beach access. No Smoking. No Pets. Bedding: Lower level: King, King. Upper level: Queen, 2 Doubles, 2 Doubles. Two lower bathrooms have showers and the upstairs bathroom has a tub/shower. Sleeps 14 Note: Widow's Walk is in need of repair and not available for use by guests. The house was spacious, the beds were comfortable, and I personally loved having crushed ice from the freezer door. Very pleased with the location. Isle plaza is beautifully landscaped with a short walk to the beach. Awesome house!!! short walk to beach. Replace our rocking chairs and added a few when we reported they were in back shape. Couldn't have been a better experience!!! !